Acid Kuba Deluxe is a larger, Toro-sized version of the original Kuba Kuba, made from the same blend of herbal-infused premium tobaccos. As an added bonus, it comes in durable metal tubes for maximum portability and lasting freshness. Grab a batch of Kuba Deluxe and bring the mind-blowing taste of Acid with you on the go. Best & best deal, period. Look long and hard to find a better tasting and better deal on ACID Cigars other than Best Cigar Prices ! This is one of the best tasting cigars that I have found. The aroma is pleasant and this cigar is relaxing. So good, even my girl likes them. I am a big fan of these cigars and getting a chance to buy it at a 2 box deal was great. Price was great. Service was great. Cigars were in excellent shape. If you haven't tried these cigars, please give it a shot. You will love them. Still waiting for them to arrive. Kuba Deluxe always a great go to cigar! Consistently great! These guys are wrapped in their own humidor package. Smooth smoke. A great cigar. he best price I can find. Still one of my favorite cigars. Wish I had purchased these instead of the Nubs. Very pleasing aroma with a sweet taste. A good alternative to Acid Roma. Exotic taste with a fine construction. The cigar burns evenly and the ash is almost like powder. It is worth treating yourself to these every now and then. 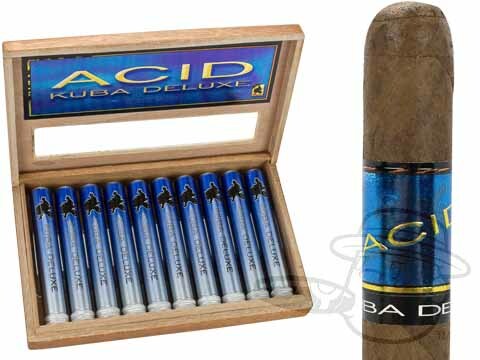 Acid Kuba Deluxe is rated 4.7 out of 5 based on 30 customer ratings.